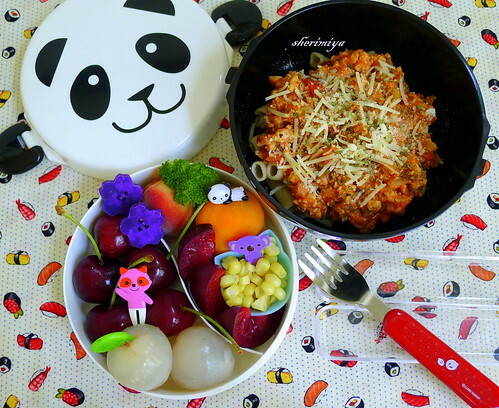 Bolognese Panda Bento, a photo by sherimiya ♥ on Flickr. Who says gluten-free has to be boring? Here's a bento for TinySprite I whipped up quickly using leftovers from dinner: pasta bolognese (naturally gluten-free) tossed with brown rice tube pasta, topped with romano and parmesan, and oregano. She's a meat lover, this girl, and meals like this are very satisfying for her. I'm happy to be able to pack it in her favorite panda bento bowl. She had previously asked to "always use this box please" - so I'm trying. The upper tier contains some super sweet dark cherries, a couple of pristine white lychee, Okinawan sweet potato flower shapes, a baby homegrown white peach, a homegrown apricot, some black splendor plums, and fresh corn off the cob. In a Dutch oven, over medium heat, heat the oil. Add the onion and cook for 2 minutes. Add the celery, carrot, and garlic and cook for 5 minutes more. Add the pancetta and cook for 5 minutes, then add the beef and cook until brown. Add the wine and the remaining ingredients and simmer for 45 minutes. Serve with cooked pasta. Sprinkle with Parmesan. Looks delicious! Definitely not boring at all! I love that little panda box. So cute ! And as Jenn said, not boring at all. Hi Sheri!!! How have you been? 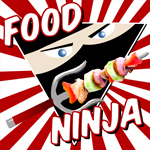 It's almost here for me to start making bento for my son... ARRHHH! I started to be panic... I won't be able to make nice lunches like you do. What do I do what do I do... I really hope practice will make it perfect. Your lunches are always so cheerful and nutritious. I really love that about your lunches! I love it! TS has great taste, that does look satisfying! Homegrown apricots!! Nothing gets better than that! Homegrown is the best, no contest. Thanks Ohayobento!